West Bilney parish lies alongside the busy A47 Norwich to King's Lynn road between Narborough and King's Lynn in western Norfolk. The parish is small and consists of a few scattered farms and a small grouping of houses alongside the main road. 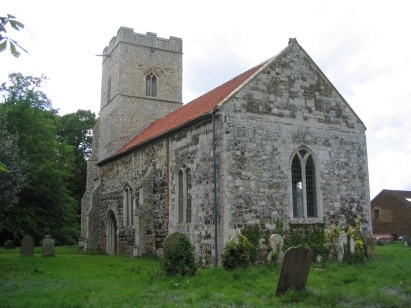 St Cecilia's church sits adjacent but set back from the main road and is now a redundant church being managed by the Church's Trust. 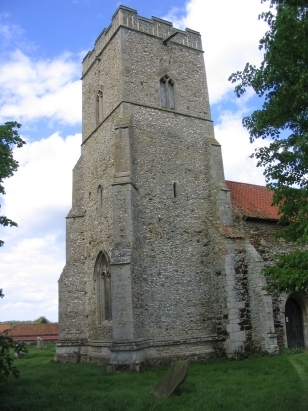 There are parts which show a Norman age, particularly in the nave, but there has been many restorations and remedial work to keep the church intact. These records were prepared from Microfilm MF599 in the collection of the Norfolk Record Office. The catalogue shows that there had been water-damage to the records but this is, fortunately, not reflected in the resultant filming. As usual there are doubts about a few entries resulting from poor hand-writing and legibility but it is to be hoped few errors will have arisen during the compilation of this transcript.